Living. Wearable. Art. 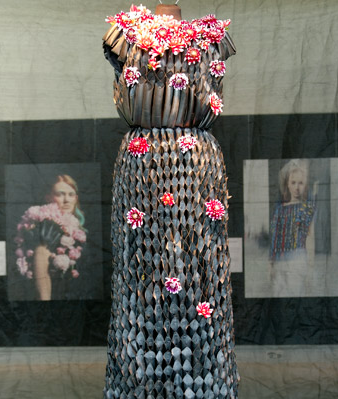 Commissioned to create a piece for the Amsterdam Centre for Architecture (ARCAM), fashion designer Mattijs van Bergen and landscape architect Anouk Vogel crafted this dress out of wool and recycled bicycle inner tubes. The flowers are held in little vases that hold the flowers’ water. I’ll post more on Slow Fashion later (along with a comprehensive list of Eco-designers), but for now, a little eye candy! 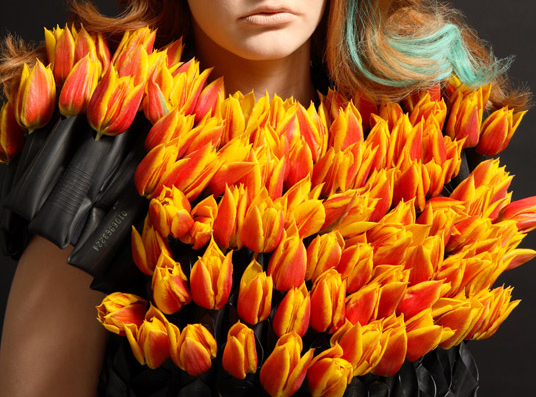 This would be really funny to watch someone wear—sloshing water everywhere with their delicate flowers. I think I’d choose some light pink peonies to put in my dress. This seems to be the sort of dress for which you’d carry a mini water spray bottle around with you at all times. Tucked away in your purse, you could easily bring it out for a full-body misting if anything began to look weepy—we mustn’t let the little darlings get parched now must we? So next time you get a flat while bicycling to work, and you’re contemplating cursing that innocent little rock in public for sneaking up on you…you can instead thank the inanimate object for getting you one rubber inner tube closer to making a DIY version of this recycled masterpiece. And I certainly want to see pictures—if anyone does make one! See more images at Ecouturre.